On Thursday, November 2, 2017, President Donald Trump announced Jerome H. Powell as his nominee for the next chairman of the Federal Reserve. Powell, a member of the Fed’s Board of Governors, has steadily supported the current monetary policy direction under Chair Janet Yellen. On Thursday, November 2, 2017, President Donald Trump announced Jerome H. Powell as his nominee for the next chairman of the Federal Reserve. Powell, a member of the Fed’s Board of Governors, has steadily supported the current monetary policy direction under Chair Janet Yellen. Will that mean a continued gradual unwinding of stimulus, or might we see changes from the Fed? Let’s take a closer look at the nominee, expectations for Fed policy and what this may mean for investors. Powell, a Republican who was appointed governor to the Federal Reserve Board in 2012 by President Barack Obama, brings with him a mix of public and private sector roles. A lawyer by training, Powell worked at the Treasury Department under President George H.W. Bush, ultimately serving as undersecretary for domestic finance. Powell also has sought a middle ground on the contentious debate over financial regulation. Trump and congressional Republicans argue that excessive regulation is restraining economic growth. At a Senate hearing in June 2017, Powell agreed that there was room to improve regulation, but he described the Trump administration’s proposals as a “mixed bag,” adding that he opposed some of the specific proposals. Powell has developed a reputation as a consensus builder who studies issues extensively before making decisions. He never dissented on any of the Fed's decisions during his time on the Board, opting instead to working behind the scenes when he felt it was important to sway the course of action. On the flip side, the risk in Powell’s appointment is that he could be too risk averse. The first responsibility of a Fed chair is to do no harm. But the second is to make difficult and sometimes rapid decisions — to lead, even when leading involves danger. Strange twists in the economy that render the staff’s economic model unreliable. It remains to be seen how Powell would be tested under these conditions. Stability with the Bernanke/Yellen era albeit with a less academic/more private sector tone in policy debates. Powell would continue the Fed tradition of active risk-management. He would continue the 2017 shift to a more resolute/less skittish Fed that is less dependent on near-term data. His policy instincts skew centrist with some shift from mildly hawkish to mildly dovish in recent years and a sense that the Fed can be patient in current circumstances. Commitment to returning inflation to 2% and to balance sheet reduction. He believes the need to keep all options open to combat the next downturn, with the current focus on ensuring inflation moves back to 2% in this cycle. He would implement the Yellen Fed’s careful approach to balance-sheet reduction, aiming for a future Fed balance sheet closer to $3 trillion than $2 trillion. Continued respect of conventional modeling of the Phillips Curve relationship between slack and inflation, though he may be less wedded to this than Ms. Yellen. Powell is not on record as having strong supply-side beliefs and may respond to deficit-increasing tax cuts in a relatively conventional way, though perhaps with more openness to supply-side impacts. Fairly clear distinction between macro-monetary policy and financial-stability policy favored by Bernanke/Yellen, though potentially with more attention to the interaction of these policy choices. There would likely be more openness to deregulation (compared to Ms. Yellen), an easing of Volcker rule restrictions, possible changes to some bank stress tests, and a review liquidity rules (without a clear bias to ease them). It’s expected that, if confirmed, Powell would continue down the path of patiently reducing the Fed balance sheet and normalizing interest rates. On financial regulation, he has suggested a more relaxed stance than his predecessor who emphasized the need for post-crisis financial regulation. In summary, we believe that Powell’s views will include a more discretionary approach (versus rules-based) to interest rate policy, normalization of the balance sheet to larger than pre-crisis 2008 (versus a return to pre-crisis) levels, pragmatic deregulation, and a similar policy that is neither more hawkish nor more dovish relative to the current Fed. The ultimate goal is to generate stronger economic growth and prolong the business cycle. The Trump administration also likely considered how easily its nominee would be confirmed. Given the other priorities the White House has before the Senate, particularly the tax bill, a contentious fight over who will chair the Federal Reserve could be a distraction the White House wants to avoid. Prior to the financial crisis, Fed nominations typically would pass easily through the Senate. Since the financial crisis, votes on Fed nominees have become more partisan for three reasons. First, the Fed’s response during the financial crisis was controversial and created a bipartisan public backlash against the institution. Second, there has been a growing partisan divide over the conduct of monetary policy in recent years. Third, bank regulation is a much more prominent issue and Dodd-Frank made the Fed the premier bank regulator. For these reasons, the Senate confirmation will be closely watched. The Senate’s 56-26 vote to confirm Ms. Yellen in 2013 was the narrowest margin since the Senate confirmation votes began in 1977. While we expect Powell to be confirmed, the margin could be even narrower than Ms. Yellen’s. If, for whatever reason, a chair is not confirmed by the time Ms. Yellen’s term expires on February 3, 2018, we would expect that the Board would elect her to continue to serve until such time as a new chair is confirmed. Another important change is the degree of the Fed chair’s power. Many decades ago, the Fed chair was viewed as a figure that has near-absolute power over the conduct of monetary policy. Under Volcker and Greenspan, the Fed chair was completely in charge of policy while the FOMC was there to counsel the chair and approve his decisions. This comes across clearly in Bernanke’s recounting of his experience: when faced with a skeptical Committee, even the highly-respected former chair built consensus. The last two chairs have radically transformed the Federal Reserve. Mr. Bernanke completely changed the way the Fed operates and Ms. Yellen reinforced it. The past 12 years have seen the role and power of FOMC members rise and the role of the chair diminish. That was intentional, as Bernanke came in with the idea of separating the Fed from the figure of its chair. He succeeded and Ms. Yellen has continued down the path started by her predecessor. With this evolution, the views of the governors are significant, and this is an important consideration given that the Trump could likely have three more vacancies to fill on the Board soon. There is no going back to the former construct. Even if Powell wanted to wield more power and marginalize the rest of the FOMC, he most likely couldn’t do so as the other members of the Committee would not agree. The new chair will have to earn the votes he needs, and to do that, he will have to position himself at or near the center of consensus. In studying bond, stock, and currency market reactions to each Fed chair nomination since 1987, history suggests that the initial reaction to a Fed chair nomination is small and doesn’t last long. In spite of the attention that investors dedicate to the subject, the moves in each market (whether at the one-day or one-month horizons) are well within the one-standard-deviation band of daily or monthly moves on any given day. There are good reasons to believe that this pattern might repeat itself again this time. Since 1987, there were three different chairs over this period, but eight nominations: Greenspan was nominated five times, Bernanke two times, and Yellen once. Generally, the bond market initially reacts hawkishly, on average. However, that effect dissipates within a couple of weeks, and a month after the nomination, yields are lower. The stock market’s initial reaction is fairly muted, but tends to improve over time; three to four weeks after the nomination, stock prices are generally higher. The dollar initially tends to depreciate, but that effect wanes after a couple of weeks. Why the muted reactions? The main factor is probably that none of the Fed chairs since 1987 came out of left field. All three of them were known figures, with either previous Fed experience (Bernanke and Yellen) or previous government experience (Greenspan). Most of the times, (five times out of eight) the market was also dealing with the renomination of the incumbent Fed chair — getting the same person is always more reassuring than getting a new one. However, there is no discernible difference in the market reaction to the renomination of an existing chair versus the nomination of a new one. This suggests that we should expect a similarly subdued reaction over the medium term. What It Means for the Markets? 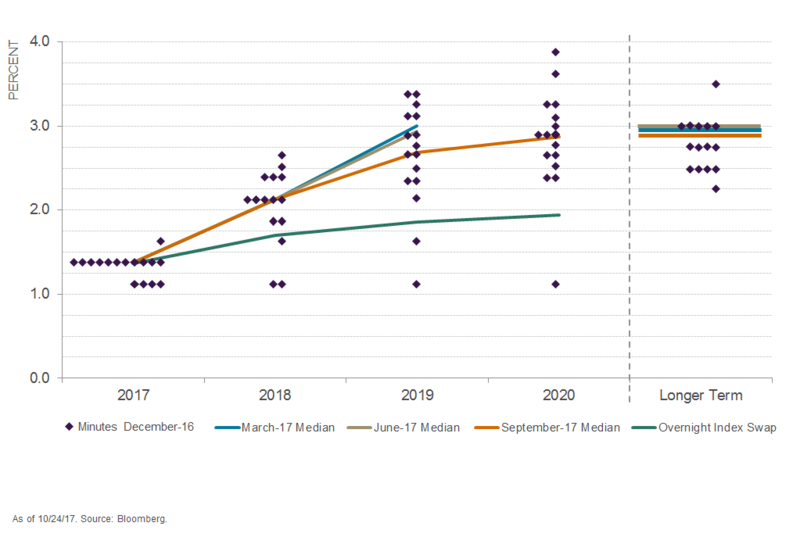 Given our expectations for continuity and gradual tightening of monetary policy under Powell, it is likely that the current dot plot illustrated below will not change. Although the current dot plot suggests 3 rate hikes in 2018, we believe that there will be only two rate hikes in 2018. The market should see this nomination as a handoff between like minds. Mr. Powell seems like the least disruptive choice, as he is expected to guide the Fed in a fashion similar to Ms. Yellen. He is also a known quantity and not a threat to markets. Just as we saw last Friday, when Powell became the frontrunner, equity markets are initially higher on the news and yield on 10-year Treasury debt fell. Since Powell is not a threat to monetary policy, is seen as relatively dovish on the regulatory front, and pursues ongoing risk management, the equity-market reaction to his nomination will probably be favorable. This white paper is the property of BNY Mellon and the information contained herein is confidential. This white paper, either in whole or in part, must not be reproduced or disclosed to others or used for purposes other than that for which it has been supplied without the prior written permission of BNY Mellon. The Bank of New York Mellon is supervised and regulated by the New York State Department of Financial Services and the Federal Reserve and authorised by the Prudential Regulation Authority. The Bank of New York Mellon London Branch is subject to regulation by the Financial Conduct Authority and limited regulation by the Prudential Regulation Authority. Details about the extent of our regulation by the Prudential Regulation Authority are available from us on request. The Bank of New York Mellon is incorporated with limited liability in the State of New York, USA. Head Office: 225 Liberty Street, New York, NY 10286, USA. BNY Mellon Wealth Management, Advisory Services, Inc. is registered as a portfolio manager and exempt market dealer in each province of Canada, and is registered as an investment fund manager in Ontario, Quebec, and Newfoundland & Labrador. Its principal regulator is the Ontario Securities Commission and is subject to Canadian and provincial laws.